"Sies" is a unique ship. The interior is not like any other. The white finish gives the boat a cossy and light atmosphere were you really feel at home. This Broom 37 is very well maintained. The owner has put a lot of work in it to make it like it is today. The engines had a revision in 1996 and the turbo's in 2011. 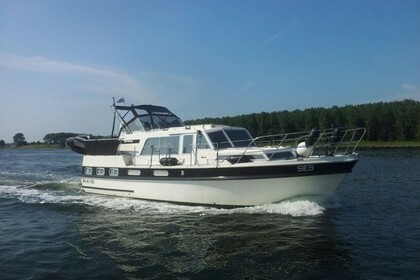 The boat is equiped with solar panels, Victron multiplus 2000 watt (2010), new prop's (2010), bowtruster (2014), new kitchen (2010) and it has a laptop with navi, Philips flatscreen with dvd player. It also has a seperate toilet and seperate bathroom. If you want more info about the boat feel free to contact me.